The son of Frank Zappa, inevitably Dweezil Zappa would lead a life filled wall-to wall with music. His father listed his religion as “musician” on Dweezil’s birth certificate! Dweezil’s early years were spent largely away from the spotlight—something of a rarity for the child of a celebrity, but perfect for cultivating a close relationship with his family. Having watched his father perform concerts from the side of the stage since he was in diapers it was no surprise that Dweezil began to show an interest in music early on. Although, he figures he was 12 the first time he heard music on the radio. Until then, his exposure to music had been limited to whatever his father was either working on or listening to for enjoyment. Fast foward thirty years: In 2015, he released his first album in nearly a decade, having spent much of his time since 2006 on the road celebrating the musical legacy his father left behind when he died in 1993 of prostate cancer. In 2016, he was forced to stop touring as Zappa Plays Zappa as a result of a cease-and-desist order filed by the Zappa Family Trust after control of the trust was taken over by two of his siblings, following his mother’s death. But that hasn't stopped him from honoring their father’s memory. 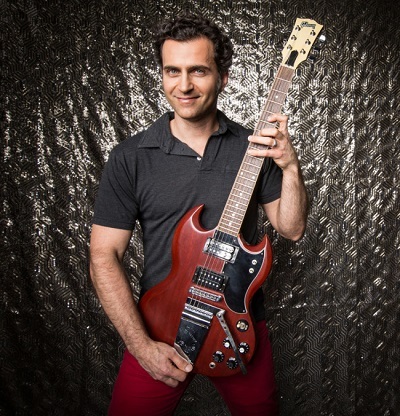 Constantly learning and evolving his guitar art, Dweezil Zappa is both the modern face of Zappa music and the person who can bring it fully-formed into the future.